Starring: Chris Pine (Star Trek), Benedict Cumberbatch (War Horse), Zachary Quinto (Star Trek), and more. 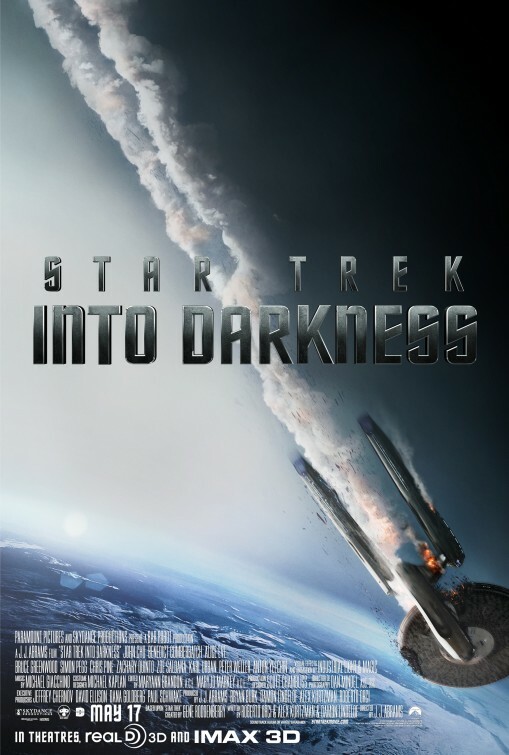 Star Trek Into Darkness comes to audiences four years after the most impressive Star Trek movie since First Contact, and, as a sequel, carries with it certain expectations and fears of quality, story and overall continuation. You must RUN to see this movie! run FAST! Allow me to express to you my sincerest pleasure with this film and my gratitude to J.J. Abrams for taking his time with this, one of the most impressive sequels I have ever watched. Hit the jump for more of my review. 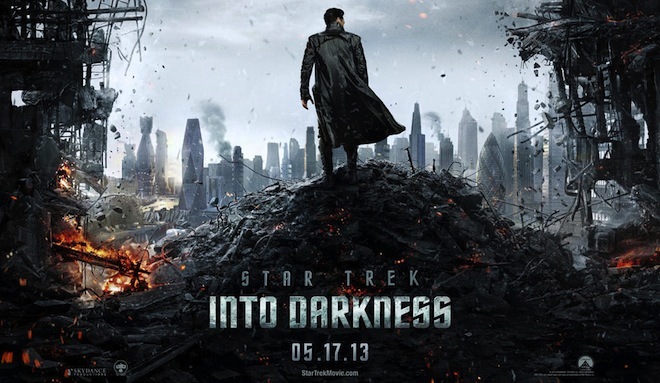 In case you haven’t figured out by that introductory paragraph…I loved Star Trek Into Darkness. This second installment of the “rebooted” franchise movies initialized by Gene Roddenberry is a worthy addition for Star Trek fans young and old, veteran and new, to enjoy. We find Kirk and the crew of the Starship Enterprise after the events of their first “mission” together and now, after a few shakeups, find themselves on a mission to search and destroy a widely unknown yet dangerous terrorist who claims and appears to be superior in every way. THIS is what summer blockbusters are all about! 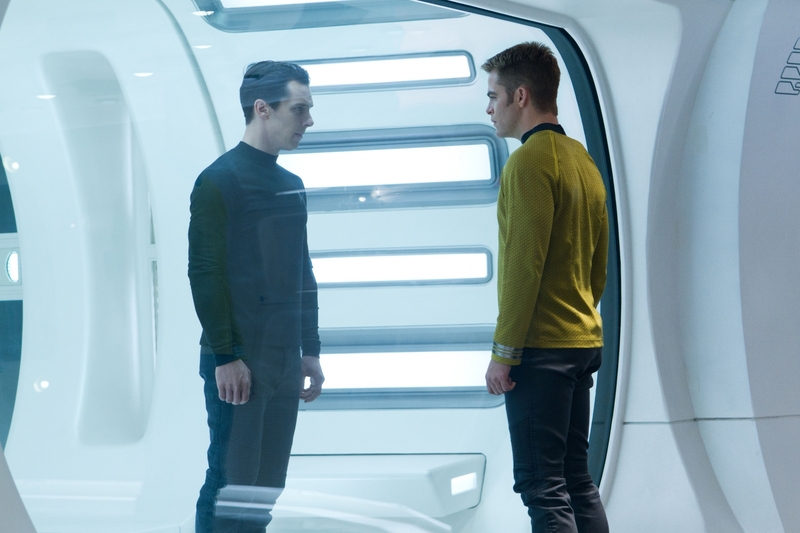 Star Trek Into Darkness starts off with grand-scale visuals, storylines, characters, excitement and edge-of-your-seat adventure that does not end! 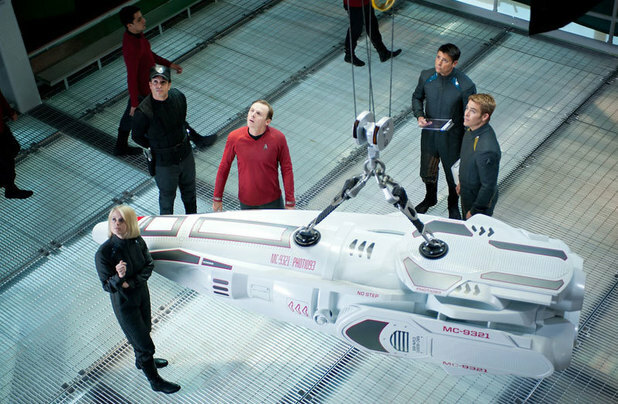 One of the things I am most glad for about this Star Trek franchise is the choice of the director J.J. Abrams. Known for his secrecy, the amount of surprises he is able to pull off in his films makes the experience of watching it even that more enjoyable. (Even if you’ve seen all of the trailers, there are PLENTY of great surprises still in store!) Granted, the cast is great as well. Chris Pine IS Captain Kirk, just as Zachary Quinto IS Spock and Karl Urban IS Bones, etc, etc, but the amount of little teases, tributes and unexpected twists that Abrams successfully brings definitely delights. Benedict Cumberbatch, perhaps mainly known previously for his role in the BBC series “Sherlock,” plays villain John Harrison and carries that lead role quite believably as a dangerous opponent for Kirk and the Enterprise. Other performances of note not already mentioned include Simon Pegg as Scotty once again who brings the majority of the comic relief and Alice Eve, who, isn’t as useless in this role as she has been in plenty of her other films (The Raven, for example). The entire crew sees further character development from the challenges they face and the motivation they receive which brings them together even more. I cannot express just how much I enjoyed this venture into “the Final Frontier,” but know that it is a nigh-perfect film despite a few minor plot issues and cliché predictable notions. A fantastic sequel that must be seen and will be enjoyed by all who boldly choose to go, Trekkie or no. Ignore the critics who have empty criticisms and low-appreciation for the concept of what a “reboot” is (as a matter of fact, ignore all reviews that do not claim to be spoiler-free), you definitely want to and must enjoy this one without the taint of spoilers or negativity. It is worth it. The special effects, the sets that were built, the story told, the special nods to well-known Star Trek lore…it all works famously well. Go see Star Trek Into Darkness, filled with action, adventure, villains, space fights and more…it is illogical to miss this film! With character interactions and development equal to the amount of action and excitement, this sequel is the perfect blend of all things necessary for this successful sequel. Get to the theater and get there now! 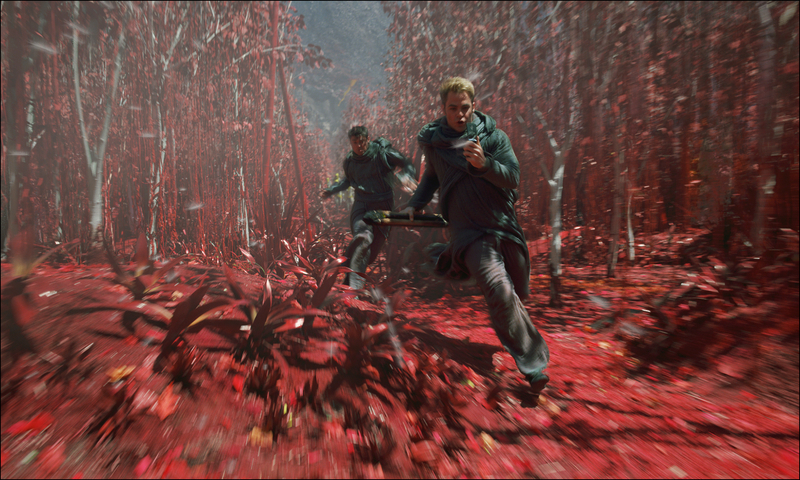 Set coordinates to your nearest cinema, Maximum Warp…and…Punch it! 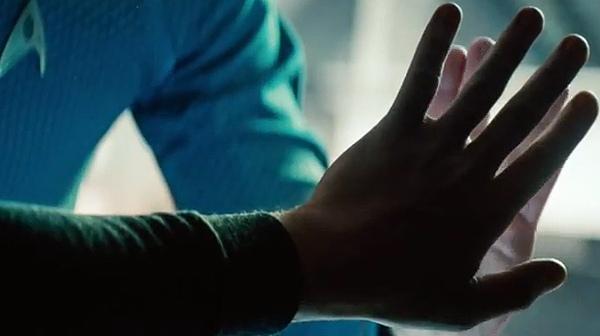 Bravo, J.J. Abrams and crew of the Enterprise. Thank you and Bravo! One of several amazing fan-made posters. Click photo to see the rest! up next: My review for MUD and Trailer Time Thursday! I cant wait! Nice review. def worth it Issy. I know you will enjoy it. I am a HUGE Cumberbatch fan! So ready for this–(helps with Sherlock withdrawals ;)) and I loved the Abrams re-boot–so, it is WIN-WIN for me. I can’t wait to hear your thoughts. Cumberbatch was impressive. thanks for reading/commenting. I do appreciate it. I’ve got my IMAX 3D tickets already in hand. Thanks, T! I very much loved it to. my only complaint mirrors that of many others: the level of predictability. but it is very easily dismissed with the amazingness of the movie as a whole! hahahahaha. this comment made me laugh, Tim! Thanks for chiming in. Nice review! I’m stoked. I dig all things Trek. 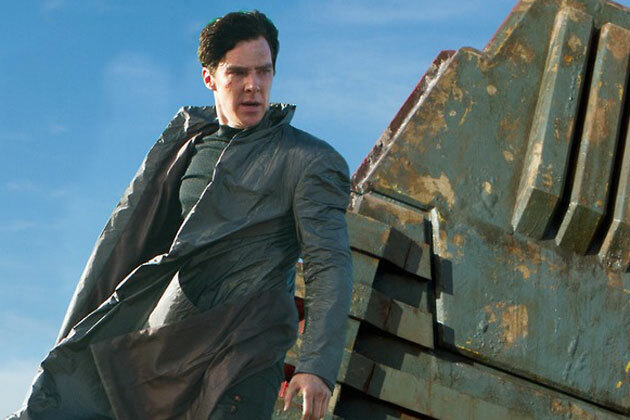 Cumberbatch looks epic in the trailers, too. Thanks! Cumberbatch is pretty solid. I look forward to you seeing it. enjoy! Thanks for reading. Saw this last night and absolutely loved it. I’m not a Trek fan (the previous film is the only other piece of Star Trek I have seen) but this is pretty close to my favourite film of the year so far. Great plot and Cumberbatch is damn close to being the best actor going around in my opinion. Not a Trek fan and still loved it. Perfect! Thanks for chiming in. Nice review, Terrence, although I disagree with you on most aspects of the film (you should check out my review to see what I think!) but you make your points well, and i don’t think I’m about the change them! Good stuff!! I gave the same rating as you, T, though mine is more of an unconventional review. Abrams made me actually care about the whole franchise so yeah, I definitely enjoyed this one. Hooray! We both loved it. 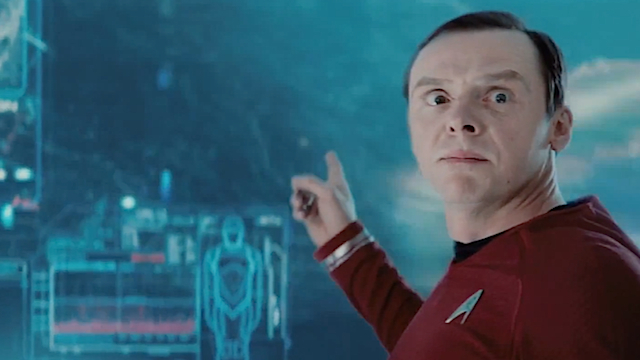 You really should start watching the series…now that you have a newfound love for Star Trek! It had enough flaws for me to downgrade it from the upper echelons, but I really enjoyed it. Its fast paced and dark, and a good summer blockbuster. No major complaints here! hahaha. well, I don’t think you are one of those critics, Fogs! but I was indeed tired of seeing several reviews online that did nothing but blast the film for being a “cheap ripoff of Star Trek II” and wrote that line with those sentiments in mind. I didn’t like how predictable the film was, but I did LOVE it. ha. I will be over to see your review in a second. I’m right there with you, T. I LOVED this. Didn’t think I could enjoy a Star Trek movie more than I did the last one but…man, this one is pretty stinking good, too. Great review. Star Trek was so great. I’m sad it didn’t open any greater over the weekend. haha. Glad you loved it too. Glad you liked it. I did as well. It got better as it went on.